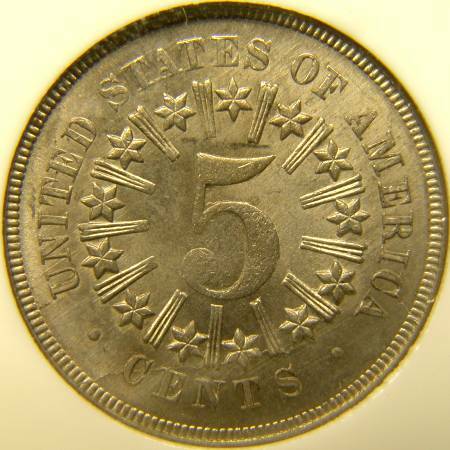 The shield nickel series is filled with many wondrous and dramatic varieties besides the 1883/2 overdate. Just to whet your appetite, here are some photos of a couple more dramatic shield nickel varieties. 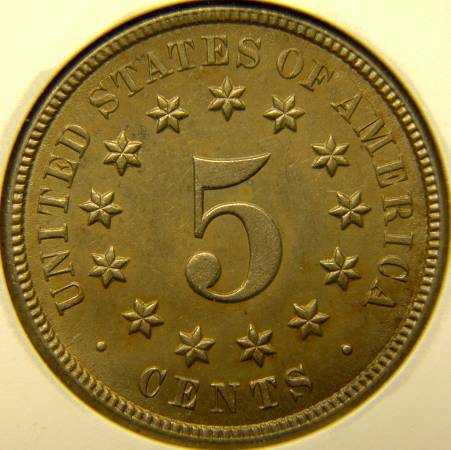 The first coin is an example of a very strong repunched date. This coin is attributed Cherrypickers' Guide FS-001, Fletcher F-08. Note the extremely wide spread of the repunching. All four digits are repunched strongly to the northeast. On both sides of the ball above the date you can see a small die crack. 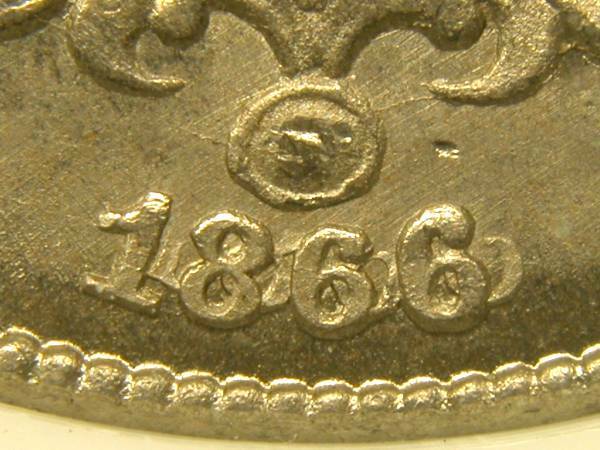 This is quite typical of shield nickels, and die cracks much larger than these and full die breaks are not uncommon. 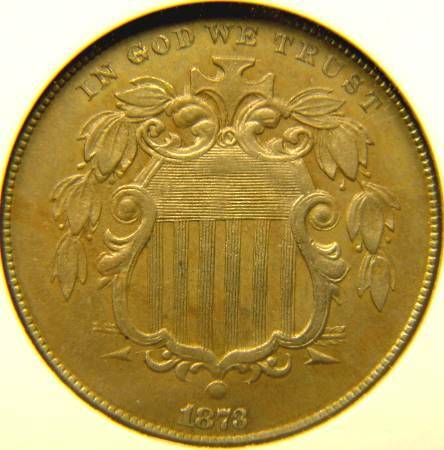 The second coin is an 1873 Open 3 with a very strong doubled die obverse. 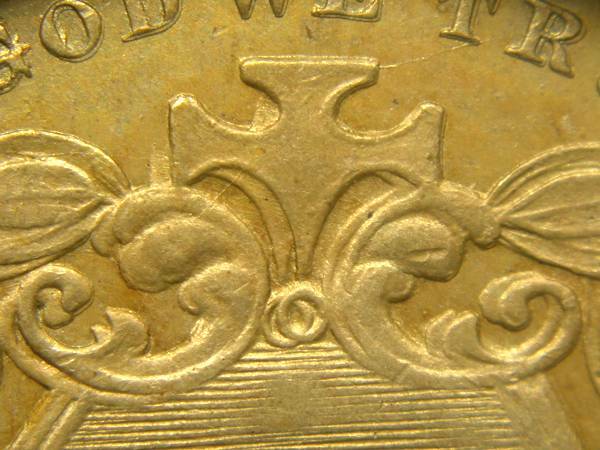 The doubling is most visible at the annulet (the little circle below the cross near the top of the coin). This coin is attributed Cherrypickers' Guide FS-008.3 and Fletcher F-113. On this coin you can see two annulets side by side. 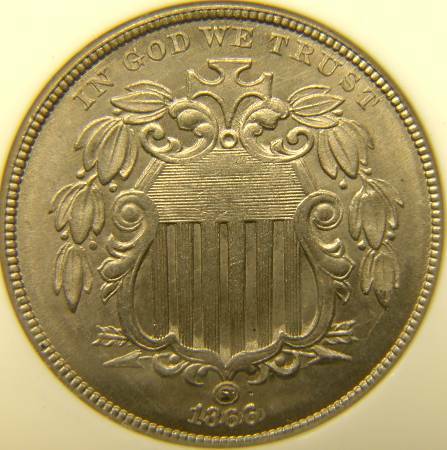 This coin displays very unusual doubling for a shield nickel, as most shield nickel doubled dies show doubled annulets in a north/south alignment rather than the east/west alignment of this coin. I hope that the information on this page serves to further stimulate the reader's interest in shield nickels. I find them to be a source of endless varieties and much fascination.